Canoe is a lifestyle brand of bags, jewelry, and accessories handcrafted in Blue Ridge Georgia in their own facility. These made in the USA Canoe Bags can be found at Standley Feed & Seed in Madisonville, Texas. The process of creating a Canoe bag is very hands-on. 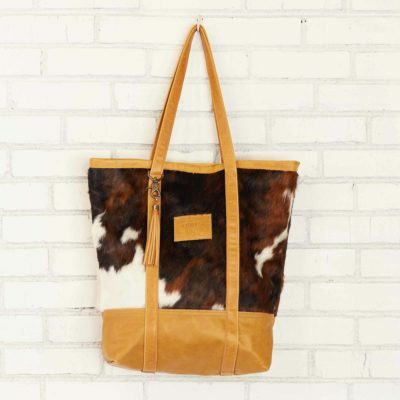 Each cowhide is personally selected for quality and uniqueness. All bag patterns are cut out individually by hand taking the ultimate care with placement to avoid obvious scars or holes. Bags are sewn with attention to detail and adorned with 100% brass hardware. Your bag will be unique with its own personality, natural beautiful blemishes, and sometimes a brand of the ranch on the hide. No two are ever exactly alike. If you are looking for a bag for work, every day, or even a trip, then the tote collection is for you. The bucket tote is a great north/south silhouette, the 2 handle tote is great for travel with a zipper closure, and the medium tote is a great everyday bag. The sporty sized backpack comes in canvas or hide. It’s a great size for everyday use and can easily fit your iPad or laptop. The duffle bag is great for shopping or as a weekend getaway bag; wear it as a cross body to keep your hands free while traveling through the airport or mall. Both styles feature 100% bottom adjustable webbing straps, brass hardware, and inside pockets. Our favorite carry-on size bag for your weekend getaway comes in three styles. Choose full hair-on-hide for the attention seeking traveler, canvas with pieced-in hide for pure good looks, or the canvas with hand-pieced-in leather for an understated look. With a detachable shoulder strap, distressed leather, and 100% brass hardware, plus your choice of either cream, olive, or black canvas, may make it hard to choose which is your favorite. Shop Standley Feed & Seed in Madisonville, Texas for one-of-a-kind Canoe Bags.